Children enter kindergarten with a wide variety of previous education experiences: some have participated in pre-K programs, whether private, state-funded, or part of Head Start, while others have spent time in a family child care setting or in informal arrangements with family, friends, and neighbors. Regardless of the setting, this transition is fraught with stress and uncertainty for many children and their parents. It is up to the educators in both elementary school and pre-K settings to ease the transition into formal education. Kindergarten represents a markedly different environment for children who used to spend their days at home or even for children who participated in pre-K programs, especially those outside an elementary school. Interactions in a kindergarten classroom become more focused on academic progress with specific, targeted goals for literacy and numeracy that may not have been present in earlier educational settings. Kindergarten teachers typically spend more time formally teaching new skills rather than supervising unstructured activities, such as “center time” when children choose from mini learning stations set up around the room. Student-teacher ratios are often much higher in kindergarten than pre-K, changing the nature of teacher-child interactions and compelling students to be more independent and interact with a larger group of peers. This transition is significant for parents as well. Contact with teachers is often more formalized and less frequent than in a pre-K classroom. There is often less emphasis on parent-teacher and parent-parent contact than before. This can leave parents feeling out of the loop when it comes to understanding their child’s academic and social progress and can lead to less parental involvement in the classroom. Despite evidence illustrating the importance of the kindergarten transition point, many schools take a haphazard approach to this process. A 2016 study found that, to the extent that kindergarten transition activities take place, they are frequently low-intensity practices such as sending brochures home rather than more effective, high-intensity activities such as arranging for pre-K students to visit a kindergarten classroom or allowing for joint planning time between pre-K and kindergarten teachers. The same study found that schools located in districts serving large numbers of low-income students were less likely to provide kindergarten transition activities compared to wealthier schools, meaning that students and families who might benefit most from transition activities are the least likely to receive them. 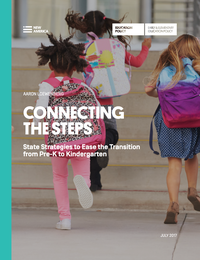 While the planning of a stable, well-connected transition between early education and kindergarten falls largely within the purview of individual schools and districts, states can actively encourage intentional, local efforts to smooth transitions to kindergarten. 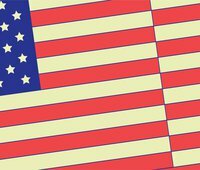 This brief analyzes actions taken by four states to improve the transition process: West Virginia, Colorado, Oregon, and Washington. Each state has taken actions to address the difficulties that often arise in the transition to kindergarten. Connecting the Steps describes the actions each state has taken and discusses the opportunities and challenges with their various approaches.